New CA Full Metal Blowback Series in stock now. Airsoft GI again got the hotest and newest item before anyone in the US or The World in this case. Looking for a cheap P90? Looking for a cheap P90? We got the Echo1 Full Metal P90 for all you CQB lovers. The Echo 1 P90 is astounding. The plastic body is extremely durable. The magazine click’s solidly into place. The selector switch is sturdy and decisive. The upper receiver as well as the rails are made of metal so that the holosights and or flashlights mounted on it are secure. The barrel features a 14mm CC threading to accept different compensators and barrel extensions. Since this is an Echo 1 it comes with a very solid 7mm metal bushing gearbox, and two standard capacity magazines! Got a G36 and don’t know how to use the high cap? Want to learn how to load your M4 high cap magazines? Just so you guys know that we are putting in some new catalory. The Echo1 MTC Product Spotlight. The Echo 1 Modular Tactical Carbine (MTC1) is a spin off of the Echo 1 G36c. The MTC is a G36c enhanced, so to speak. The folding stock has been replaced with an M4/M16 buffer tube, and the magazine well has been changed with the M4 magwell adaptor. By changing these two key components on the G36c Echo 1 has opened up many new possibilities for customization. Also included with the MTC are two rail segments that are made to replace the iron sights on the top rail, making it more useful for mounting low optics like reflex sights. Aside from these exterior modifications it’s still the same great performing and reliable Echo 1 G36c that we all know and love. 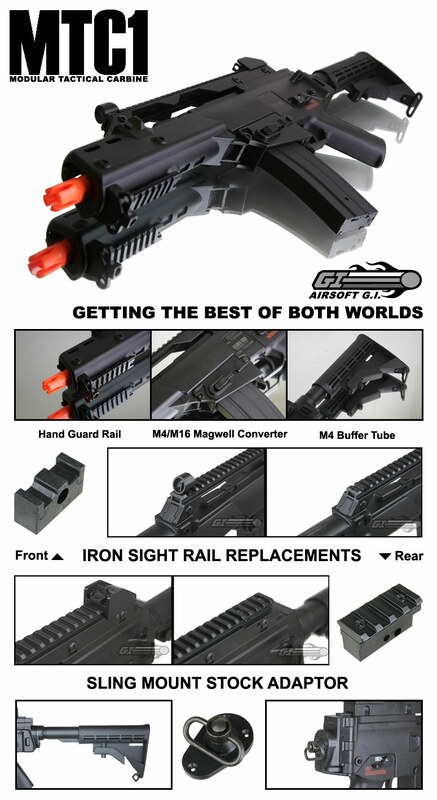 Package Includes: gun, magazine, battery, charger, stock adaptor, rail adaptors.